Rose likes old school cameras and never really got into digital - especially current point and shoots because she never like holding the camera away from her body. I don't blame her as it's usually hard to see what your shooting in the LCD screen. I liken this style of shooting as "holding a stinky diaper". You have to hold the camera afar if you want to inspect what you're looking at. One could use the rangefinder viewer and still have the benefits of digital photography like decent sensors and quick play back. (For those who's never shoot film style 35mm, you actually put your eye on the viewfinder to see what you're shooting. LOL.) It's mirrorless so there is no camera shaking from the mirror vibration. No mirror equals no vibration. No vibration equals no unintended shaky blurs. Plus it's really retro styling. Cool. Now I get to test drive it. And after yesterday's rain, it was a good day for photo ops. 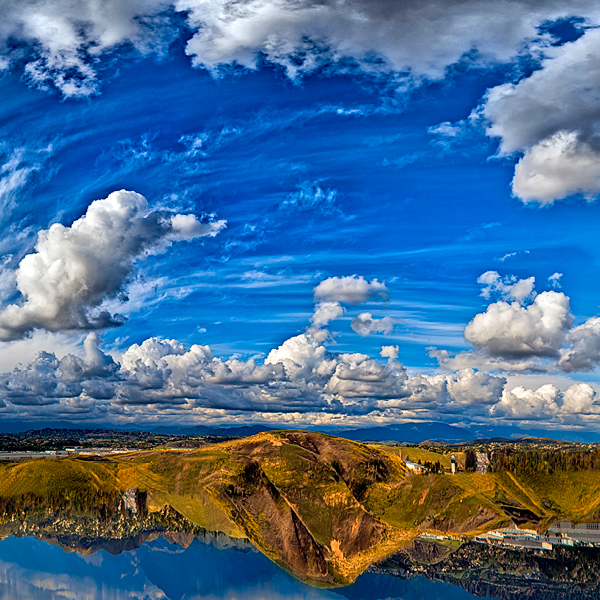 This one is made up of at least 16 images stitched together in Photoshop. Unlike my Canon shots, I never experienced problems with stitching all the images except for the long computer wait. The final image file is huge. Like 12 MP per image x 16 images. That's a total of 192 MP, which beats Hasselblad's 40 MP. Of course with a huge file, it would be extremely difficult to share the image through cyberspace. So, I have to resize it to 740 kb. Kind of defeats the purpose but hey at least I can boast of having a high resolution file sitting at my home computer (heh).